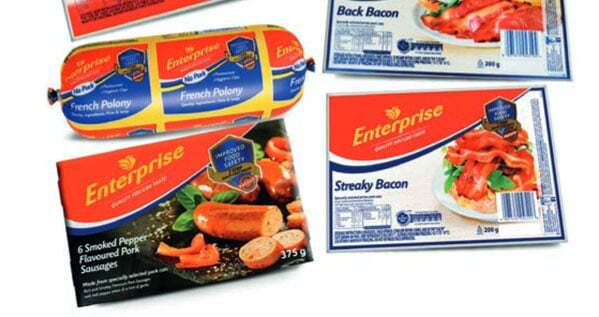 After several months in the wilderness and off SA’s retail shelves, the Enterprise range makes a welcome return to supermarket fridges in packaging that restores consumer confidence after the listeriosis saga. After damage to its reputation and trust, rebranding must have proved to be a strategic, emotional and creative challenge for the Enterprise brand group and Gail Macleod’s Stratcom design team. Using bolder, brighter colours, and more white to highlight ‘cleanliness’ and ‘freshness’ was the outcome. Long-time loyal supplier, Colpak (waiting patiently in the wings to press the restart button), flexo printed the lidding for the five Enterprise Bacon wrappers and 500g and 1kg Vienna packs using a Bobst/Gidue Athena press, Millian inks and plates from Raised Image, while Multivac supplied the base material. Polony casings for the three variants were printed by Colpak on a Mirage solvent-based machine with Sun Chemical inks and Raised Image plates. 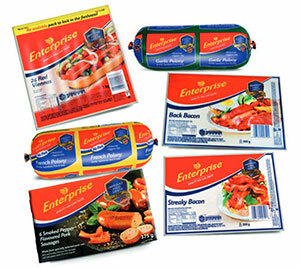 Golden Era printed the three variants of Enterprise Sausage cartons. Welcome back!